● 2 Lines × 16 characters LCD. ● Suitable for domestic version. ● Better than 3% accuracy (current). ● Accurate digital readout of disconnection time. ● Accurate digital readout of disconnection sensitivity. ● Automatic data hold function. ● Zero crossing circuitry permit testing at 0° or 180°. ● Disconnection phase polarity shown on LCD display. ● Auto off and off override. 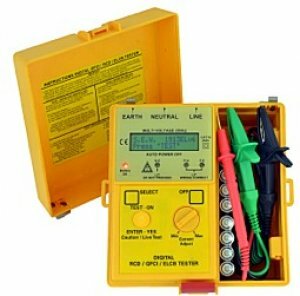 ● Measure voltage between Line and Earth before testing.